Earlier this year, AXELOS, the owners of the ITIL intellectual property, released the Foundation publication and certification part of ITIL 4. But what is it? 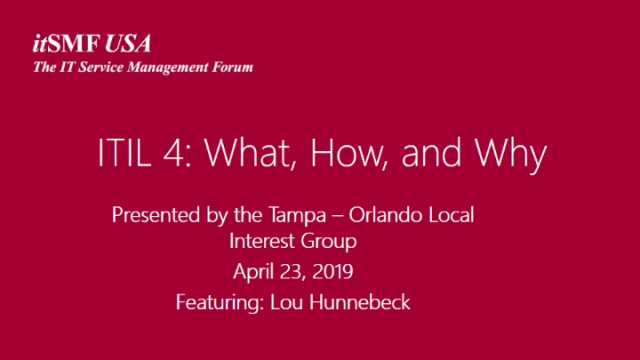 Our speaker, Lou Hunnebeck, is one of the authors of the new foundation material and the lead editor of the “Direct, Plan & Improve” ITIL 4 publication currently being written. She will speak with us about ITIL 4 and share key information and insights. •Maximizing your value from ITIL 4. We’ve all moved into the future. ITIL is doing the same! Ragu Mantatikar is a multi-skilled IT Service Management, Program/ Project Management specialist and a certified ITIL, Prince2 Trainer with extensive experience in Service delivery, ITSM/ITIL processes and tools implementation in various organizations including internal and outsourced environments across APAC region over 20 years. Currently moved to San Francisco and working in SKAEL Inc., as Vice President looking after Service Delivery of Artificial Intelligence-based products. This Webinar session will consist of a brief walk through of Software Asset Management’s foundation. Diving deeper into answering the age-old IT question “What do we own and how do we own it?” Specifically, we will highlight various types of legal documentation, noting key verbiage and contractual elements Software Asset Managers encounter in their day to day responsibilities. The briefing will cover various aspects of reviewing, drafting and negotiating agreements to ensure adequate protection and overall license term understanding. Attendees will gain insight into defining drafting and assigning SAM policies, procedures and responsibilities. ‘DevOps’ has become a magic word in IT. But what is DevOps, really? And what is its relationship to Lean IT and Agile? Two key experts who are furthering adoption and development of the DevOps Agile Skills Association (DASA), Mike Orzen and Niels Loader, attempt to clear up any confusion as they review a brief history of DevOps. In this day and age, it is almost impossible to open a website, article or publication about IT without coming across DevOps. It seems to be defining the current state of development of the IT industry. It is also one of the most misunderstood and misused terms today. DevOps is a label we have devised to describe the journey of the IT industry towards the application of Lean principles to the delivery of IT services and customer value. This session offers a loosely scripted conversation between two thought leaders in the DevOps community in which they explore the relationship between Lean, Agile and DevOps. Are you doing Continual Service Improvement by ACCIDENT??? Do you think you are not doing Continual Service Improvement (CSI), or not doing it well? What if you found out that you ARE doing CSI, but just don't realize it? If you think that you don't have time to improve, or have no idea where to start, and cannot get management buy-in and sponsorship to begin CSI, then this session is for you! Don’t let your service quality be held back because CSI is too hard to get started. Skills, Knowledge Leadership, Sharing - Navigating the new ITSM Way of working! USE PROMO CODE - EC18WEB - to obtain an EARLY BIRD rate for Executive Connections. A $200 SAVINGS! Problem management is the hidden treasure of Service Management. It is key to ensuring reducing the cost of IT services, improving the value of IT services, and improving customer satisfaction. But how do you justify investing in problem management? Too frequently problem management is understood as something that must be done when things really get bad, or when a customer is screaming because of a failure somewhere else, or as a “last resort” when no one knows what else to do. In reality, problem management is key to improving the performance of IT and improving the customer’s view of IT’s true capabilities, whether related to technology, applications developed in-house, software, cloud services, etc. You name it, problem management has a role. This webinar will dive into the exclusive Executive Connections program available at FUSION 2018. Learn more about how this opportunity can enhance your educational experience through exclusive exposure to industry leaders and experts. The Executive Connection sessions will include stories from Executives; attendees will hear from two Keynote Speakers and share leadership concepts. It will also facilitate networking between you, your peers, and the many invited industry experts, and ensure you are getting the most from your time at the conference. The IT infrastructure management landscape is rapidly changing. Much of what IT used to support, build and deliver on premises is moving up into the Cloud. IT services are moving up and out of the data center and access to these services is moving beyond the four walls of the business. New technologies and devices are spreading and stretching when and where IT services can be used (e.g. Internet of Things). While the shift towards more agile and flexible delivery channels for IT services is creating new business opportunities, it is also creating new business challenges for securing the IT infrastructure and delivering those services safely. How are IT organizations meeting this challenge? What strategies are organizations employing? What technologies, processes and organization changes are taking place to keep the business safe? Learn some answers to these questions and leave with ideas and a roadmap to secure your own IT Infrastructure. Speakers are from Duquesne Light and CTP, LLC. As technology continues to evolve and becomes a bigger part of everything we do, it’s not just the computers on our desk anymore. The line between field operations and IT has become less clear, and this can affect IT service management. How have changes in technology impacted the relationship between IT and field operations? What challenges has this brought to IT service management? How is or has your organization addressed those challenges? This presentation will discuss the Agile, Lean and DevOps journey taken at Nationwide Insurance over the last 12 years. Carmen will discuss what has worked, what didn’t and the challenges facing a Fortune 100 company in implementing DevOps practices. This will include impacts on culture, technology and practices including the metrics to use as guideposts on the journey. Making DevOps work in a IT Service Management framework can be challenging. How can we Ensure people see the value in ITSM rather than see it as a bureaucratic slow down to the business? Dale Shafer, Senior Consultant at a Service Management Global Consulting Practice and a member of itSMF USA’s Board of Directors, and will discuss how automating ITSM is an important element in ensuring collaboration with Devops and Agile. Dale is a Senior Consultant at a Service Management Global Consulting Practice. He is a proven leader with 10+ years of experience assessing, designing and implementing large scale Global Outsourcing Delivery engagements focusing on IT Infrastructure Operations, Service Management and Service Integration. His sector experience includes Agribusiness, Banking & Financial Services, Legal, Government, Healthcare, Manufacturing and Retail. Education includes MBA and IT degrees. ITIL and Microsoft Certified. The Centers for Disease Control and Prevention achieved a milestone when its mid-tier data center in Atlanta earned its Service Management & Information Security Management Systems Certifications, becoming the first federal data center to do so. In this case study, the speakers explore the entire process from the initial discussions about certification through scoping and planning, prepping for certification and the audit process and how the CDC gained buy-in in the organization. From the agency perspective, we will hear what the process is like from first-hand experience. If you are considering ISO/IEC ISO/IEC 20000-1:2011 & IT Information Security ("ISO 27001:2013") certification this will be an insightful and useful session. ITIL will be re-written. So how would you do it? What would you want to be simpler or more easy to understand, yet without loosing so much high-quality essential best practices? The President of the Kansas City LIG has a way forward. In an article published in The Source last April he outlined how to re-group the 26 processes in ITIL into three or four sets. In it, the Service Lifecycle takes a back seat to practical organizational functions. Once you have change management and incident management working well, then the rest is simple. You logically expand the base from there. All process still apply while none stand alone. This is also a chance to ask an expert. What does your organization look like? What should it be aligned to good practices? Here's how to go forward from there. Soooo… where do you turn to when you want to better align your resources and capabilities with your service strategies and the business goals and objectives? With what’s the least mature? Maybe. Maybe not! What steps would you take to understand on what to improve? All IT services, processes, organizational structure and technology are “vulnerable” and hence should be open to the positive impact of CSI. This presentation focuses on CSI and the positive impact it can have on the business. CSI's focus is on identifying, prioritizing and choosing improvement opportunities in the Service Organization that will best benefit the business. Everyone is so busy working on projects and on normal daily activities to keep the lights on, there hardly seems time to spend on continual improvement efforts. Any what about the funding? It’s easy to explain to the business why funds should be found for new systems or exciting new features, but how do we get them excited about improving processes or other methods? In our session, we will: •Explore the benefits that continual improvement efforts can provide to the business •Discuss methods of marketing these benefits to gain support and funding Whether improving services themselves, or our associated processes and work methods, returning value to the business is the mission. Don’t be the next news headline! Recent theft of business critical information occurred because a Service Desk provided information to a cyber-crook that allowed access to internal business critical servers. The information stolen could impact national security interests. Why did that happen? How could it happen? Expensive technology did not stop this breach. How could the Service Desk have been better prepared? Security breaches and the theft of intellectual property and personal and financial information are too common. The service desk is KEY to ensuring the early detection of security events and providing the first-line response. So what role should the service desk play in early identification of security events, and how can the service desk best be prepared to respond? Are there best practices to provide guidance to develop robust cyber-protection? This session explores cyber-resilience best practices and the impact the service desk plays in response and cyber-resilience. This presentation will offer guidance on using the ISO/IEC 15504/33000 Assessment Methodology to conduct a maturity assessment of your Problem Management Process as part of your Continual Service Improvement (CSI) initiative. With the goal of achieving continuous improvement of the Problem Management Process, ISO/IEC 15504/33000 offers a structured methodology for process baseline and follow-on assessments. As a flexible assessment solution, which can be adapted to a company of any size, an assessment using the ISO/IEC 15504/33000 methodology provides the first step in a Continual Service Improvement initiative. itSMF USA is the definitive & authoritative source for the advancement of IT Service Management best practices.